Royal Northern Yacht Club Regatta at Largs, 1873. Start of the Race for 40-Tonners. The Royal Northern Yacht Club is, in point of seniority, the fifth oldest club in the kingdom. It has a somewhat unique history, for, though a Scotch club, it was originally formed at Belfast. It was founded in the autumn of 1824, and several Clyde yachtsmen joined it. 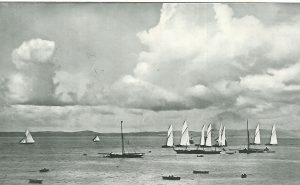 The first regatta was held in Belfast Lough in 1825. With so many Clyde yachtsmen in the club, a separate division was formed for the Clyde. The Irish division ultimately went out of existence, and the Clyde branch then settled down as a purely Scotch club.The prefix Royal was granted to the club under Admiralty warrant on May 10, 1830, and it continued for many years to be the only prominent organized body devoted to the sport on the Clyde. Its quarters are at Rothesay, where it has commodious premises close to the sea-front, and always gives a two days’ regatta during the Clyde Fortnight, in addition to club cruises and matches for local yachts throughout the season.